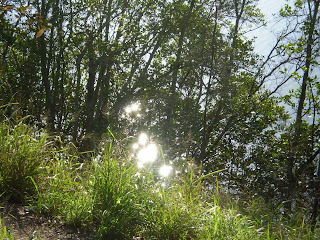 This is a photo of the river sparkling. What appears to be sky above the trees is actually the river beneath the mangroves, with the sun dazzling up the water under the trees. The sun catches the gentle ripples but the camera can only capture the static image. Imagine, the light is actually dancing on the surface. A feeling of exuberance pervades the river valley. Rainbow lorikeets chatter loudly above, the magpies' carrolling echoes sweetly over the water, while the tree ducks sit atop their favourite branches and quack 'growlily', as they gaze at an old retired greyhound racing in circles in the open field having a marvllous time. Backwards and forwards, charging around and around his owner; it's a gala performance of joy. The river is a wonderful place for restoration - for person, dog (and other animals) and habitat. So while the riverbank awaits its restoration and removal of a zillion noxious weeds, from lantana to prickly pear, from asparagus twiner to brambles, from the emerging spiked thistles and more, the place itself provides a restorative atmosphere for its visitors, human and other than human. It's not surprising (to me at least) that recent research shows that people prefer greened environments to built environments. For example, Hartig and Staats (2006) comment that 'North American and European adults tend to prefer scenes of unthreatening natural environments over scenes of ordinary urban environments without natural features'. I wondered if such a conclusion was obvious but then, a few days ago in the blog, I cited research on urban American children who preferred shopping malls and manicured parks over woods and other wildish places (Bixler, Floyd and Hammet, 2002; Bixler and Floyd, 1997). It seems odd to me that research into the restorative capacity of natural habitats for humans often bears little relationship to the issue of environmental care and action. There is a documented relationship between the health and wellbeing of humans and the health and wellbeing of ecosystems (e.g. Albrecht, 2005; Ecohealth Journal). So with this in mind, notions of reciprocal relationship, eco-mindfulness and a restoration ethos could well be included as significant variables in research into aspects of the human-nature relationship. If nature offers a place for human restoration, could we humans then offer to restore its degraded habitats? Could restorative experiences in nature lead to nature restoration? I ask this because yesterday the World Conservation Union released its latest RED LIST of endangered species. It is a lamentable tale. Globally 16,306 species are threatened with extinction - 188 more than last year. And for the first time on the list species of coral and coral reefs are cited as emperilled through the impacts of El Niño and global warming. There are now 41,415 species on the IUCN Red List. 'We are facing an extinction crisis,' says the IUCN. '99 percent of species at risk are because of human activities.' Gorillas and orangutans, vultures and crocodiles, parrots and river dolphins and many many more. One in four mammals. Special places like the river valley can offer a haven from this awareness. The terrible knowledge does not disappear altogether, there is too much local ecological damage for that, but exuberance masks the devastation. My heart breaks then soars. Restorative places like the river are precious. Albrecht GA, 2005, ''Solastalgia': A New Concept in Health and Identity,' PAN: Philosophy Activism Nature, 41-55. Bixler RD and MF Floyd, 1997, 'Nature is Scary, Disgusting, and Uncomfortable,' Environment and Behavior, 29, 4, 443-446. Bixler RD, MF Floyd and WE Hammitt, 2002, 'Environmental Socialization,' Environment and Behavior, 34, 6, 795-818. Hartig T and H Staats, 2006, 'The Need for Psychological Restoration as a Determinant of Environmental Preferences,' Journal of Environmental Psychology, 26, 3, 215-226.